The dominant topic in real estate in this cycle is the vast out-performance of urban versus rural areas in this recovery. 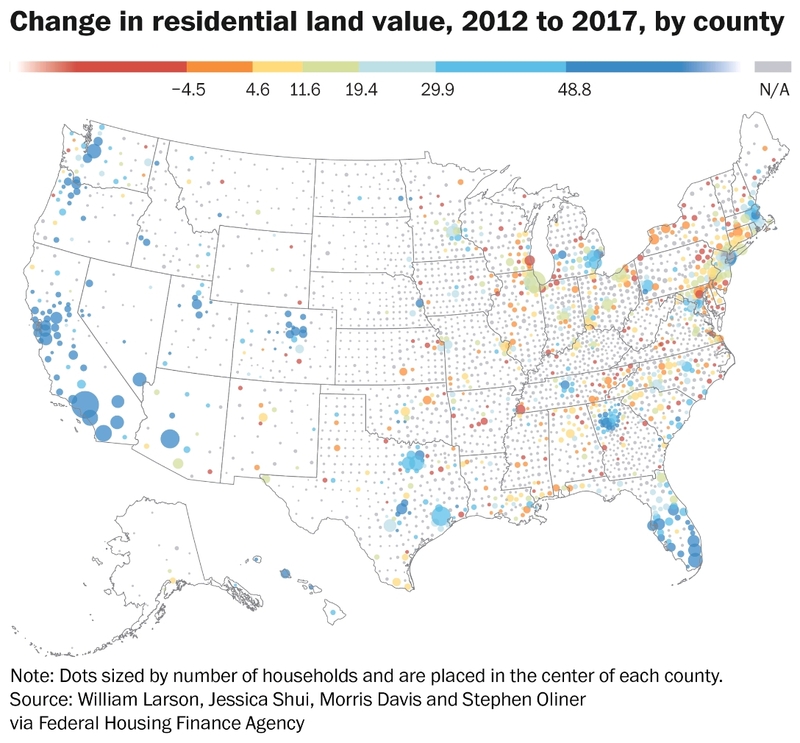 The graphic below shows the rapid pace of land price appreciation (shown in blue) in urban areas compared to the decline (in red) in rural and exurban areas. Let’s take a deeper look at what is going on. Aging baby boomers moving back in town and selling second (and third) homes, a smaller cohort of affluent Gen X and Y buyers, and the tide of millennials held back by student debt and fear of housing market instability. The normal cyclical pattern of real estate price recoveries moving out from the core to the periphery has been much slower this cycle, but it is there. For example, take a look at the isolated bright blue dot in Maine. That’s not the southern coast which has been smoking hot, and is the blue cluster on the map. The lonely bright blue dot is Kennebec County that is just north of the coastline. Kennebec County is the cheapest place to buy housing and commute to jobs in Portland, Brunswick or Camden. Look at all the red in Connecticut, especially compared to the vibrant blue in New York next door. Downsizing in financial services, the relocation of GE and a general shift away from Fairfield County as a corporate destination has exacerbated demographic shifts in some of the wealthiest communities in the country. In Greenwich, in-town is vibrant but further out, the big square footage builds of the last 20 years have been tough sells. We are seeing the first waves of millennial buyers coming into the true luxury space. The themes? Authenticity, simplicity, sense of place – good news for what we do at LandVest. New York City is three years into a softer real estate market after a huge run up to 2015. Supply is finally meeting demand in Boston. As a result, we are seeing the disparity shown in the chart above beginning to reverse. Some of this is driven by prosperity, this last cycle has made it possible for buyers to take advantage of great values outside of the city, for country and coastal properties. With luxury real estate and second homes, the path ahead depends on stability, both political and economic, and positive capital markets returns. Stay tuned for the LandVest index, our annual look at the high end real estate market across New England and the Adirondacks. We are here to help anytime. Principal and Vice Chair of LandVest's Board of Directors, Ruth Kennedy Sudduth co-leads LandVest's Fiduciary Real Estate Services team, focusing on advisors and private clients.